First, I want to apologize if I've missed the information I need on your site. I've been reading various things and Googling for hours, so hopefully I didn't. I recently purchased an aquarium "for my daughter" for her birthday. (She enjoys watching them, and I enjoy them as well). We settled on getting a few guppies because we wanted multiple fish, but only have a ten gallon tank. We got the fish from PetSmart and the associate told us we could have four in the tank and it would be fine. We also have six ghost shrimp and one snail. First I wanted to make sure this is an appropriate amount of fish for the tank size? Next, I started doing some research because I believed one of the fish to be pregnant, but after researching I think all four fish are males. I'll try to attach some pictures, if you could please let me know what you think, I'd be a lot more comfortable with a professional. The "tuxedo" guppy is the one I thought is pregnant. If they are all males, is it okay if they stay together in the tank, or will they fight and stress each other out/possibly kill each other? Also, as you can see in one of the pictures one of the fish has a string of poop, from what I've read this is from over-feeding, which makes sense as I'm still getting used to how much to feed them properly. I will be heading back to the store to get some marine salt and algae food then and return the poor snail (it is indeed a "mystery" snail). To clarify, if I wanted to add in say two (good number?) 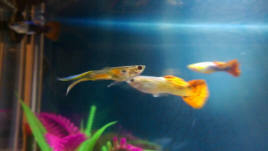 more guppies to help with aggression, I'm assuming I'd need to move them to a bigger tank? <If you look at those all-male Guppy tanks, there's often a dozens! But in 10 gallons, I'd say 5-6 specimens, tops. See how they do for a few weeks. I will definitely try to get some of the fern, I've been trying to find a good floating plant, I've been reading that guppies really like them. I managed to get a hold of a 40 gallon bow front tank, as soon as I can find a suitable lid for it I plan on moving the guppies and shrimp to it. I'd like to get a couple more types of fish to add in also. I've read that zebra Danio can do well with guppies. <Yes, they can, but not consistently well. Sometimes they can be "nippy". Also I would love to get a plecostomus, they're one of my favorite fish. Would a Bristlenose Pleco be suitable for a 40 gallon tank with 6-7 each of guppies and Danio + the ghost shrimp or would I be better off omitting the Pleco? Would the guppies and Danio be happy with that number of each? I will plan on getting some more guppies then (being careful to get females this time) and a pair of bristlenoses as soon as I get my tank habitable. Hi. I have a 15 gallon tank containing 6 neon tetras and 1 purple mystery snail. Yesterday I added 3 guppies to my tank. The guppies were extremely active and chasing each other. One of my guppies disappeared overnight. He probably died and was eaten by my mystery snail. The guppies that remain are calm this morning. What do you think went wrong with the third guppy? Picture of my remaining fish. Picture of my purple mystery snail from the back. Thank you. Hello, My name is Jackie. I have a 55 Gallon Community tank and a Fry/ Pregnant Female Tank. In my fry tank I have 3 Pregnant females and about 22 1 week old Fry. One of the Females I have in that tank is getting huge. I have had her for 2 weeks and she is pregnant but she is just sitting at the bottom of that tank. The last female to have fry did it when I was at work so I don't know if this is the beginning stage of labor or something is wrong? I am considering getting a 10-gallon breeding community of guppies. I am thinking of getting 2 males. I obviously can't house all of those females, so what if I only add another female? Also, if I let the baby guppies range free, with lots of plants, will they be OK? We go to the petstore on Friday, so I'd like a response before then. Hello, I have female guppy in a breeder net and she is huge (fat) and pregnant but her gravid spot is pale almost clear and she always hangs out on the bottom of the net do u no what I should do will she explode. 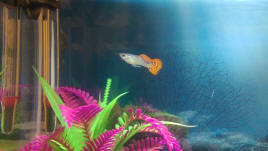 My very pregnant guppy is lying on her side and seems to be breathing real hard (or whatever you call it). She's been very quiet for a few days. I have her in a large trap with forage on the bottom. She likes to hide in it. She doesn't seem to be eating either. Today she started to lie on her side a lot.